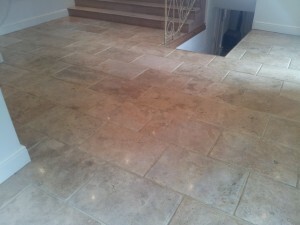 A lovely tumbled, semi – polished Travertine floor. We were contacted by the house keeper of this beautiful house near Banbury in Oxfordshire who had previously used our floor cleaning services in a different part of the house. This Travertine tile cleaning in Banbury Oxford consisted of this breakfast area, an entrance area and a w/c. The stone has a semi-polished finish. 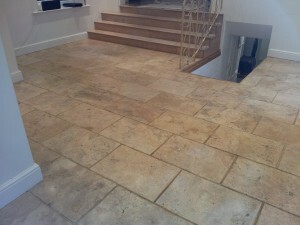 We cleaned and re-sealed this gorgeous, chunky, tumbled Travertine floor in Banbury, Oxford with great results! In the before picture you can see that the grout lines were grubby and the floor was dull with little reflection. In the after picture the floor is much more reflective of the light, the grout lines are lovely and clean, and the floor looks as good as new 🙂 After deep cleaning the stone and grout lines we finished off the floor with some specialist natural stone sealer. If you are looking for a natural stone cleaning company in Oxfordshire, contact the professionals.